Advanced Test Equipment Rentals (ATEC) and NH Research, Inc. (NHR) today announced a rental partnership agreement for NHR’s 9300 Battery Test Systems. NHR is a world-leading manufacturer of power electronics and battery test instruments as well as test systems. ATEC is a worldwide leading rental company of test equipment for military, defense, aerospace, communications, semiconductor, consumer electronics, and many other sectors and able to supply NHR’s high-power battery charge/discharge test systems. NHR’s 9300 Battery Test System is designed for either characterizing or emulating all battery chemistries including lead-acid, nickel-cadmium, and lithium-ion. 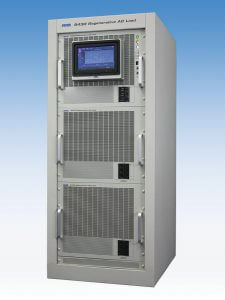 This test system is a regenerative, fast-acting, modular, dual-range, bi-directional DC source/load providing up to 100kW per system in either a high-current (600V/333A) or high-voltage (1,200V/167A) range. When more than 100kW is needed, the modular design allows easy expansion up to 1.2MW in 100kW increments making the 9300 ideally suited for energy storage testing used in electric-vehicles (EV) and energy storage systems (ESS). The 9300 is fully programmable allowing it to act as a fast-acting source (charge), a regenerative dc load (discharge), or a bi-directional voltage source (battery) with any programmed combination of constant power, constant voltage, and constant-current regulation limits. It’s frequently used for battery charge/discharge cycling or emulates a battery for testing chargers as well as other battery related power devices. Known as the latest in battery turn-key solutions, the 100 kW NHR 9300 is a welcome addition to ATEC’s continuously expanding inventory of power supply and loads test equipment. ATEC offers long and short-term rentals of test and measurement equipment for a variety of industries and applications. Customers prefer to rent from ATEC to test out equipment like the NHR’s 9300 before they buy, when they have a short-term need, if they need an urgent replacement or for any other rental reason. Because of an extensive inventory of in-stock products and the latest technology on the market (like that used within NHR’s products), ATEC is able to create flexible, affordable rental plans and pricing options to match specific client needs, with no waiting. The experienced technical and customer support staff helps provide the knowledge, equipment, and solutions customers need to perform their tests. ATEC also offers many other NHR products, including standalone AC and DC loads, and power supplies. NHR’s 9300 Series High Voltage Battery Test System is available for purchase from NHR, or rent from ATEC. Since 1981, Advanced Test Equipment Rentals (ATEC), a leading high tech equipment rental company provides short and long-term rental solutions of testing, analysis, inspection, measurement, monitoring, simulation, powering, certifying, and commissioning equipment to the aerospace, automotive, biomedical, communications, consumer electronics, defense, environmental, engineering, marine, power grid, transportation, and compliance testing companies. ATEC is ISO-9001 certified, and ISO 17025 Accredited in calibration. To find out more about ATEC visit www.atecorp.com. NH Research, Inc. (NHR) designs and manufactures power electronics and battery test instruments as well as complete turn-key test systems. Its products are used worldwide by manufacturers in the switching DC power supply, UPS, battery, and battery charger industries. Applications typically involve either characterization or final test of customer products where a combination of advanced measurements, rapid test times, and ease of setup and use are important. NHR has been supplying power electronics test solutions for over 50 years (more about NHR) with fully equipped facilities with highly skilled employees in Irvine, California and Shenzhen, China. To find out more about NH Research, Inc. visit www.nhresearch.com.